A stained glass window which took eight years to come to fruition has been dedicated at a church on an RAF base. 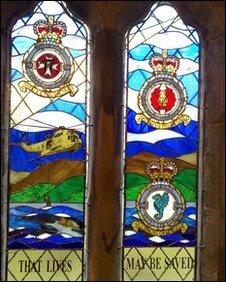 The two-part window, depicting rescue work, is sited to the side of the altar at the RAF Valley church on Anglesey. It was the brainchild of 38-year-old Simon Allen, a former winchman who now trains air crew instructors. The window was created by Karen Newby, who makes stained glass windows, and Lindsey Abbott, who paints and restores them. Ms Newby estimated that she had worked for more than 350 hours on the project, which began eight years ago with the start of the fundraising effort. Her husband Brian Newby, a former air vice marshal and ex-director of flying training, was station commander at RAF Valley. 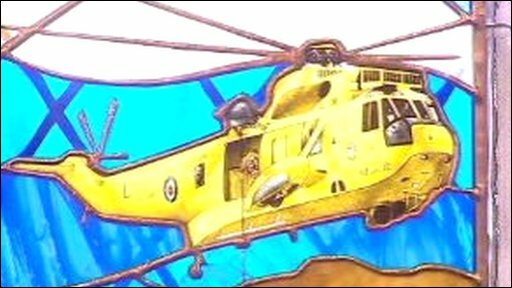 The window, which is in two parts that are each 6ft (1.8m) by 2ft (0.6m), depicts the life-saving work of the Search and Rescue Training Unit, 22 Squadron and 203 Operational Conversion Unit Squadron. It also illustrates the work of the RNLI and the RAF mountain rescue team. Mr Allen said: "It just shows what goes on at the station and shows the work that people are doing and it shows how valuable it is. "The tag line in the bottom of the window is 'that lives may be saved' and that's what it's all about really."